Salmon & Trout Conservation Scotland is inviting consumers to help identify those supermarkets that are stocking salmon from farms which are failing to control deadly sea lice parasites. The inexorable growth of the salmon farming industry in recent years has occurred at considerable environmental cost, particularly the impact of high numbers of sea lice parasites spreading from fish farms to threaten highly vulnerable juvenile Scottish wild salmon and sea trout populations. In many areas, despite the intensive use of aggressive chemicals and other methods to control sea lice on salmon farms, numbers of the parasites are frequently over the industry’s recommended Code of Good Practice threshold for treatment. Research indicates that there are some 120 salmon farms in Scotland within regions where the industry’s own aggregated sea lice figures exceed the recommended threshold limits. Fish farm cages can contain hundreds of thousands of farmed salmon, which, where treatments fail, act as efficient hosts for the sea lice parasite, which then reproduces, releasing huge numbers of mobile juvenile sea lice out into the local marine environment. Carrying an unnaturally high burden of sea lice is known to compromise severely the survival of juvenile migratory salmonids. Lice feed by grazing on the surface of the fish, eating the mucous and skin. Large numbers of lice soon cause the loss of fins, severe scarring, secondary infections and, in time, death. Quite literally, the fish are eaten alive. 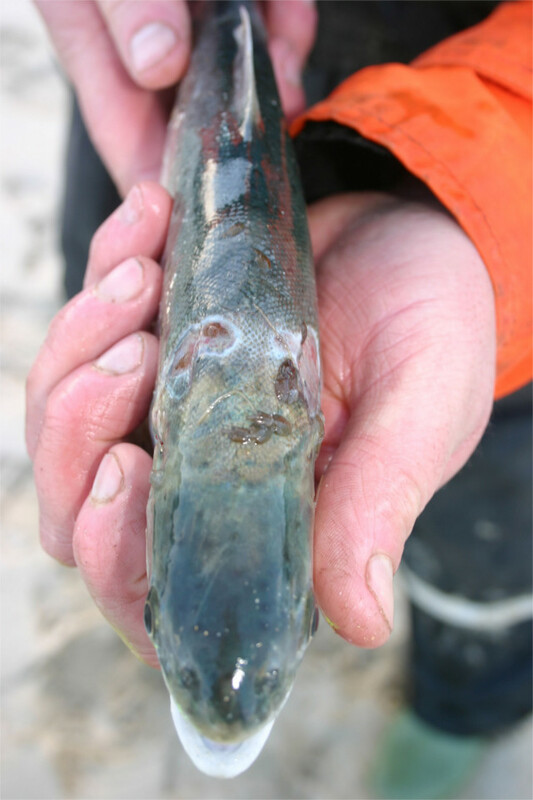 Although background levels of these parasites occur naturally in the sea, juvenile wild salmon and sea trout are not equipped to cope with large infestations. The advent of salmon farming, in largely enclosed sea lochs, has led to a fundamental change in the density and occurrence of sea lice in parts of the coastal waters of the west Highlands and Islands, with gravely negative consequences for juvenile wild salmonids. We would like consumers to help identify those supermarkets which are selling fresh or smoked salmon grown in those parts of Scotland which are failing to keep sea lice numbers within reasonable limits. If the salmon has no farm origin listed on the packaging, tag the supermarket and ask them why? If the salmon comes from one of the farms listed on the S&TC website: (https://www.salmon-trout.org/uploads/image/FarmList.jpg) that are in a confirmed high sea lice region, tag the supermarket and ask why they are selling it. For more advice, please contact Lauren Mattingley at S&TC by email: lauren@salmon-trout.org. Picture caption: Carrying an unnaturally high burden of sea lice is known to seriously affect the survival of juvenile migratory wild Atlantic salmon and sea trout populations. Lice feed by grazing on the surface of the fish, eating the mucous and skin. Large numbers of lice soon cause the loss of fins, severe scarring, secondary infections and, in time, death. Quite literally, the fish are eaten alive.